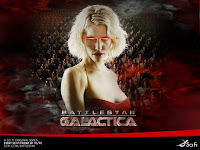 Having just finished watching the Battlestar Galactica series for the second time, I have to say I am just as impressed with the power of the "re-imagined" 2004-2009 series as at my first viewing. The above is the short pitch for the TV movie debut for the series. A "complete series" set of DVDs is now available for the 4-year run of the Syfy network show for around a hundred dollars. My main two reactions after having finished the entire series for the second time--a couple of years after the show finished--are that the producers allowed the dramatic situation to play out realistically, creating very powerful episodes, and also an admiration for the intensity that the actors brought to their characters. 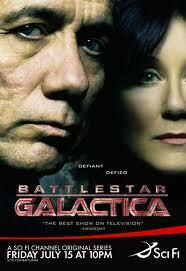 Galactica Commander Adama and President Laura Roslin are two primary roles in the series, played by Edward James Olmos and Mary McDonnell. The roles of steel-hard commander Adama and former kindergarten teacher Roslin (now president of the colonies) played by these two actors are combinations of implacability and vulnerability that truly reveal the human depths of the characters. In general, all the characters are seen at their best and their worst. At various times we are amazed, disgusted, disappointed, and inspired. We see individuals questioning their humanity because of the decisions they are forced to make, and we see a new race, the Cylons, whose newly enlivened emotions are rocked and jolted as they watch the roil of emotions of humanity. There is a large cast of significant characters, too many to detail, but two demand mention--albeit that I am doing a disservice to those excellent actors whom I am not mentioning. 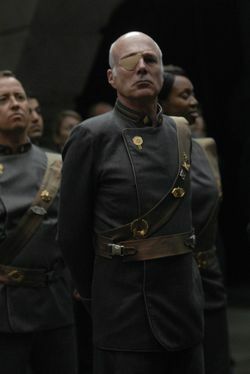 Michael Hogan portrays Colonel Saul Tigh, a tough-as-nails drunk whose weak spot is his cat-on-a-hot-tin-roof wife Ellen. The eye patch is appropriate; he's a pirate of a character: a staggeringly despicable character who is tragically flawed yet provides unexpected moments of elevated human emotion. 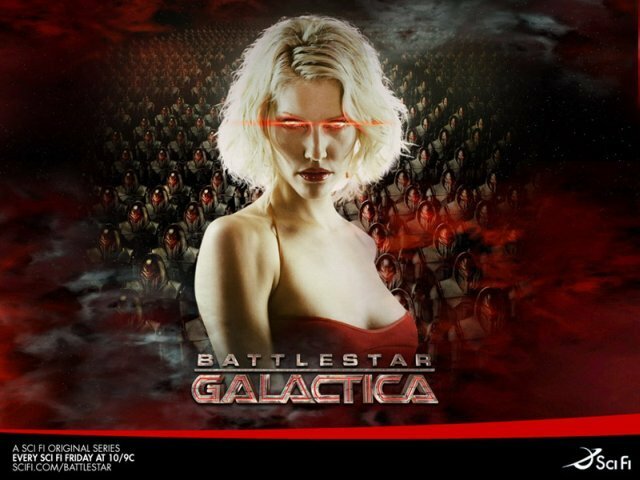 James Callis portrays Dr. Gaius Baltar, a genius who spouts grand concepts but who is always out for ol' number one. Callis's characterization is inspired: comic relief and the source of all evil poured into one character. Baltar is the study of a weak man faced with great danger and great opportunity. He manages to live through all and provides many moments of introspection on the difficulty of making the right decision at the right time. At times the series is unflinching, and watching the drama unfold is uncomfortable. Perhaps it was the opportunity to watch episodes one after the other that added to the intensity. At least, though, having the DVDs allowed one to skip through and beyond the cliff-hangers. A final thank you needs to be given to the series, its creators, and the Syfy network for allowing the series of four seasons to end and provide closure. This is not just a TV series that ended by not being "picked up" for another season. Not all will like or admire the ending conceptualization, but it does provide a sense of completeness and meaning to the rocket-jockey ride that the series gives the viewer. I watched this show when the first time I got spectrum tv from https://www.bestbundlepackages.com/ them. The first thing I watched on cable TV was this show.